Sometime between 4,100 BC and 2,500 BC, Pre-Phoenician Gozitans carved two massive megaliths into temples which now stand as mysterious monuments to a bygone age. Legend has it that they were transported to the island by a giantess called Sansuna, hence the site's name: Ä gantija. Large stones balls in the area have led archaeologists to conclude that the massive blocks were rolled into place. Two temples have a common façade but each has a separate entrance. Inside the walls, animal sacrifices occurred during ritual observances. 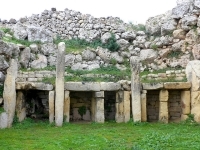 The temples, along with other similar complexes on the main island of Malta, are documented as the oldest free-standing structures in the world. For this reason, the extremely impressive Ä gantija Temples are a famous UNESCO Word Heritage Site. But the site is not equipped with as much information as some visitors might desire. It's best to do some research beforehand or to join a guided tour as added knowledge greatly enriches the Ä gantija experience.